2nd Royal Gloucestershire Hussars arrived in Egypt on 1st October 1941 as one regiment of 22nd Armoured Brigade which was allocated to reinforce 7th Armoured Division, in preparation for General Sir Claude Auchinleck’s planned offensive in November. 7th Armoured Division, whose divisional emblem was the jerboa, or “Desert Rat”, included two other armoured brigades, the 4th and the 7th, as well as an infantry support group. In 1st Army Tank Brigade were 44th Royal Tank Regiment which had been converted into an armoured battalion from 6th Battalion, The Gloucestershire Regiment in 1938. A year later 50th Royal Tank Regiment was created when 44th RTR was split into two battalions, and it too would later see service in the Western Desert. The opening campaigns of the war in Africa in 1940 had seen enormous gains made by British Commonwealth and Empire forces, with Sir Alan Cunningham’ army destroying the Italian forces in Ethiopia and Sir Richard O’Connor’s Western Desert Force advancing across Libya. Hundreds of thousands of Italian prisoners had fallen into British hands. But overstretched lines of communication and inadequate resources ensured that when the German Afrika Korps under Lieutenant-General Erwin Rommel arrived to shore up the Italians, all the territorial gains made in Libya were lost and the British had been driven back into Egypt. General Wavell was replaced by General Auchinleck as Commander-in-Chief Middle East and Lieutenant-General Cunningham was given the command of the newly formed 8th Army. “. . . I think chaos is the only word that applies to the ten days or so that it lasted and for the German and Italian troops as well. We lost a number of men, had a number taken prisoner and wounded and found out to our bitter cost that our 2 pounders were useless against the German tanks. Nevertheless, by 7th December, Rommel’s losses in tanks had vastly outstripped the rate at which they could be replaced, and the 8th Army had gained the upper hand. Rommel was forced to abandon the siege of Tobruk, and gave the order to retreat, a delicate operation which was undertaken with great skill as his pursuers closed with their foes. The Crusader tanks of 2nd Royal Gloucestershire Hussars had taken a hammering and on 5th December the battalion been re-equipped with American M3 Stuarts, known to the British as “Honeys” because of their reliability. They weren’t entirely popular with their crews though – their 37mm guns were not quite as powerful as the weak 2 pounders of the Crusaders, and unlike the sleek British cruisers, they had a high profile, making them difficult to conceal in the open terrain of the desert. In fact, the first batch of fifty-two Honeys had been taken over from the 8th Hussars, and they were already close to being worn out themselves. Operation Crusader petered out in early January 1942, and 2nd Royal Gloucestershire Hussars were withdrawn into Reserve. Rommel’s counter-stroke, which began on 21st January, would be devastating. 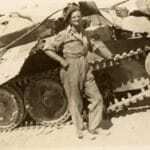 Picture: Trooper of the Royal Gloucestershire Hussars beside his knocked out Crusader tank.